Here at Thoughtful Systems, we have been helping service businesses become more efficient and profitable for almost 30 years. Our flagship product is the Scheduling Manager, a service business management software that has been developed over a period of 27 years. In the following guide about implementing management software for your business, we guide you through the steps of making an informed decision on how to choose the right business management software that best fits your specific service business. Computer software is not the only element which helps make your business efficient, but it is a critical one. ‘Below, we will explore various ways in which your software can help make your business more efficient and help you save time and make money. That’s the name of the game, after all, isn’t it! We begin with general discussion of computer software, and some history of its use in business, in order to show how increased automation, and later computer software, helped drive innovation and make businesses successful. We will explore how companies, such as American Airlines, Otis Elevators, and others, became the large successful companies they are through the intelligent use of business management software. The idea of programming was around long before we had modern computers, particularly PCs that are now found on every desk of the modern office. Programming itself is really just the implementation of a set of repetitive tasks or actions. The dawning of the industrial revolution saw the invention of the spinning jenny, which allowed machines to make clothing items based on programs provided on punched tape. 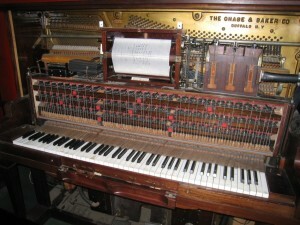 Another example of a programmable machine was the player piano or pianola, an inventive musical device which used punched tape rolls as its programs to play tunes on the piano. During World War II, Alan Turing developed the the first physical computer that helped British Intelligence to break the German Enigma codes. The German Enigma Machine was a coding device, used to encode all messages between German U-boats and their military command. The U-boats were causing enormous destruction of British and American ships in the Atlantic, and British Intelligence rushed to find people who could work at breaking the codes. Alan Turing first developed a theoretical model for a programming machine while he was a professor at Cambridge. This was a “program” on a long paper tape, which instructed a “reader” what to do: go forward, go back, add one number to another, and so on. After the war broke out, Turing developed the first working computer, which was able to decrypt the Enigma coded messages by trying out hundreds of thousands of possible combinations very quickly. Turing and his team were very successful, and played a major part in helping to end the German military and naval dominance during the war. Thus, with the birth of modern computers, it became possible to create programs to solve all sorts of problems. If a complex process can be analyzed and embodied in a set of commands, then it can be encapsulated in a computer program. The computer can do repetitive tasks over and over again very quickly! However, by the early 1960’s, people began applying computer power to other problems, such as improving business efficiency. One notable computer program was called SABRE and developed by IBM for American Airlines. At that time, the flight booking process was incredibly complex, time-consuming, and completely manual: the entire process of looking for a flight, reserving a seat and then writing up the ticket could take an AA agent up to three hours for each booking. To solve this problem, American Airlines partnered with IBM and spent an astonishing sum of $40 million (about $350 million in 2000 dollars) to develop and install the first ever automated booking and reservations software – the SABRE system. When it went online in 1960, the system was an immediate success. 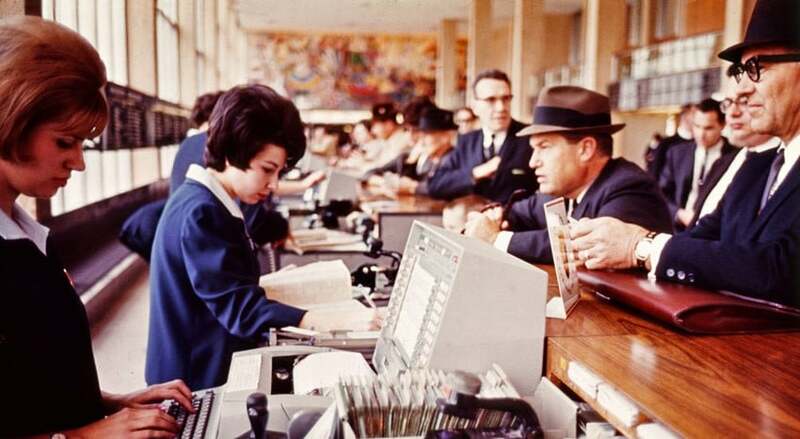 By 1964, the system took over all booking functions for American Airlines, handling 83,000 phone calls a day. After some time, American Airlines began to dominate the industry because of the greater efficiency they achieved through the use of computer software for their booking process. Eventually, they licensed SABRE to other airlines, so they could also get the benefits of the software without having to develop their own. In exchange, American Airlines continued to enjoy the benefits resulting from this software and the fees paid to them by the other airlines! Today, American Airlines is the largest airline in the world, with annual revenue of $40 billion, and the SABRE system is used by booking agents, travel websites, and other major airlines around the world. 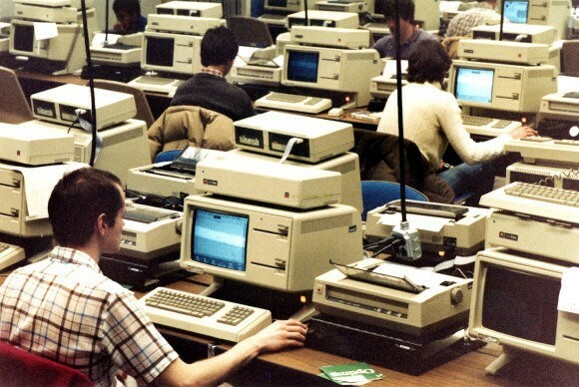 By the 1970’s, computers were being used for a wide variety of business purposes, including the stock market, brokerage firms, and various other business applications. Now, they were also being used for defense purposes, such as controlling guided missiles, nuclear weapons, war simulations, etc. It was around this time that another change in computer applications took place: in the past, the hardware was by far the most expensive item, but gradually, the programming – the software itself – became the most expensive part of the computer. By the 1980’s, with the introduction of the PC, it became possible to have a computer on almost every desk, although, there wasn’t much software yet available for PCs. The first software applications were broadly based programs, such as spreadsheets and word processors. These are referred to as horizontal software programs, because they can be adapted to almost any purpose where calculations and data organization are required. Soon, people began to write specialized programs for certain defined purposes and for specific industries. These became known as vertical software programs. More and more of such vertical software applications have been and are continuing to be developed as the years have passed. In the early days, someone could enter their customers’ names and addresses in a spreadsheet, record information about employees in a word processor program, and then use a simple accounting program (or spreadsheet) to create invoices. Later, business users could make use of an email program to send out reminders, and perhaps for marketing purposes. As time passed, the vertical software programs became more detailed and more sophisticated. Some software programs showed that large business entities could be dramatically improved, or even saved form downfall, by the intelligent use of computer software. For example, Otis Elevator was experiencing a bad time, as people were complaining about service and switching to other providers of elevators because of the long waits to get elevators serviced. In consultation with Intelligent consultants, Otis Elevators developed software that could use data from previous service calls to construct likely future scenarios. An analysis was made of the most frequent cause of elevator failures and which parts were required to solve those problems. Then, the company built a network of inventory supply centers at various places around the country, stocked with the appropriate quantities of critical spare parts. By analyzing data they had available in their software, they were able to determine the required items to stock and their desired optimal quantities.Thus, the company could stock the strategic parts in the appropriate quantities, so that technicians could have these items on hand quickly. As a result, elevator service time dropped dramatically, and so did the costs of getting the inventory to the technicians quickly. The software plus the strategic changes in inventory stocking policy enabled the company to turn around! We can see here the close connection and the parallels between the way the software functions and the way the company is organized in real life. The computer PLUS the software makes for a working system, or a machine. A machine is a thing which accepts inputs at one end and processes these in a formal and predictable manner, producing outputs that will enable the humans operating it to gain something. Ultimately, the intelligent use of software with computers provides the capability to do forms of analysis in very short periods of time, and to act upon the results of that analysis, to improve business processes.